I’m thrilled to announce that my patterns are now on my site. I have many more in the works but I wanted to get it all rolling so tada! Thank you Dave for setting that up. I also finally got my Etsy shop up and running! I need some help readers, I’m looking to have samples made of my work, some fabric, wallpaper, wrapping paper, dishes, pillows…stuff like that. If anyone knows someone that could help with that or might want to collaborate let me know please. Now, I have to say a few thank yous. I’ll make it brief. Mary Jo Matsumoto who I’ve done illustration work for ordered some prints from me, which planted the idea in my mind that I should make a shop. Shortly after that, Anna saw my work and posted it on her Absolutely Beautiful Things blog which lives up to it’s name. She also ordered a print! Then, Holly of Decor8 ( a wealth of beauty and inspiration) saw that and posted a flattering commentary on my art/ordered a couple of prints. Then, Erin of Design For Mankind (finding beauty in everything) saw Holly’s post and posted her favorite pieces of mine and ordered some prints too. I love the piggy-backing. I can’t go into a whole flowery diatribe about these incredible women cause you’d be reading all day, but I must say that I admire them on so many levels. They not only maintain inspirational blogs & do inspirational things in their lives, but they have also made themselves accessible on so many levels. I’ve shared so many emails with them. I ask for a little feedback and they give me great gems of wisdom. I value their friendships and mentoring so much, I just had to post my thanks here. I really want to make a go of this pattern thing and I had no real idea where to begin, now I have a direction though it’s daunting. The ladies have provided me with a real support, a community that makes me feel very lucky to be an artist/blogger and have gotten to know them. I just wish they all lived here so I could thank them with a big dinner and dessert party at my place. That’s an open invite to come to Brooklyn! 9 Responses to Launch! A new pattern section on my website now exists. Plus, prints of my work are now in an Etsy shop! So amazing! 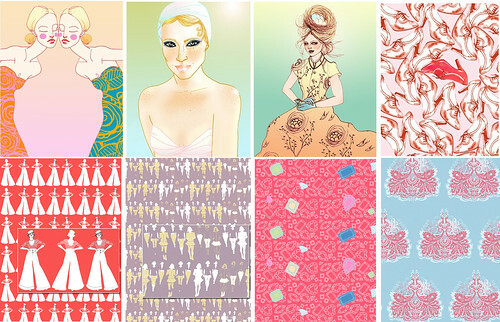 I realy hope you can get someone to do a fabric with your patterns, I would love to make these with it! I hope so too. I’m on the lookout. ha….of course. I can’t believe you remember that! I’ll dredge it up and have a print made for you. 11X14 ok? Actually maybe I’ll have a couple of prints made for etsy. I’ll get back to you. You’re so great Christine. I like these patterns a lot! 🙂 Why don’t you set yourself up with a screen-print etc? It’s not very difficult or expensive. I def want to learn how to screen print and will take a course this summer but I don’t know how to do it right now. That would be a great way to make samples. In the meantime I will try to find someplace that can do it for me. I should probably have a short run of fabric made too that I, or someone great a sewing can make into stuff. I have to get on it. Thanks so much for the compliment. It means a lot coming from you!! Ummm. obsessed with the sailors! I want pillows. Stat! If I had it, it woudl be yours. It’s a mock up in photoshop. But I’ve gotten some requests and need to make samples so I think that will be the one….it’s so yours. oh my!!! Congrats!!! I’m going to your Etsy shop now.